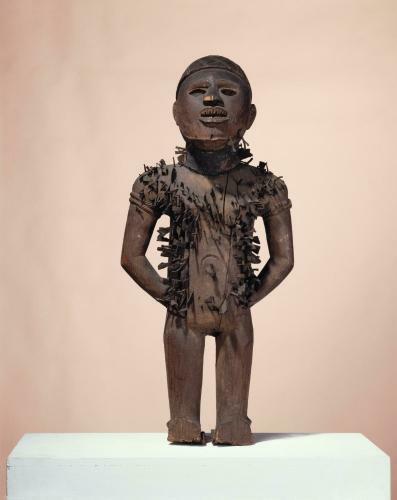 The famous “nail fetishes” of the more coastal part of the Lower Congo cultural area have attracted the attention of early missionaries and today’s collectors. Spiked with nails and iron blades, these aggressive figures mysteriously unite conflicting powers. Instruments of peace, hunters of witches, they also helped drive out illness or solve problems. This statue belonged to Guillaume Apollinaire, a great collector of African art, like his Cubist friends Braque and Picasso. The poet found in so-called primitive art “a general revitalisation of the aesthetic”.